Note: This is in reference to the 1961 film starring Audrey Hepburn and directed by Blake Edwards, not the novella by Truman Capote on which the film was based nor the catchy 1996 song by Deep Blue Something. Enter the dwelling of any single girl and you will most likely find a DVD of Breakfast at Tiffany's and/or a framed black and white poster of a scene from said film. So what is it about Breakfast at Tiffany's that causes us single girls to idolize it so much that we have things hanging on our walls to honor it? I will admit the plot of the film is rather silly and ridiculous at times, but the life of a single girl can BE rather silly and ridiculous more often than not. In a lot of ways, Holly is just like us: naturally flirtatious, commitment phobic, charmingly quirky, unabashedly shallow, and secretly vulnerable. She throws random parties, dates guys for money, and sleeps with her neighbor. She is leaving the dream! And of course, she is "CRAZY about Tiffany's!" Aren't we all? She probably eats over the sink, too. Who can forget the first scene in the film as Holly alights from a taxi in New York and nibbles on a croissant in front of Tiffany & Co. on Fifth Avenue? It is early morning but she is decked in a long gown (Givenchy, of course), elbow length gloves, giant pearls and a mini-tiara. Her hair is immaculate. Yes, she has sunglasses on, but wouldn't you? I dare any other girl to look this amazing OWNING the walk of shame as Holly does. 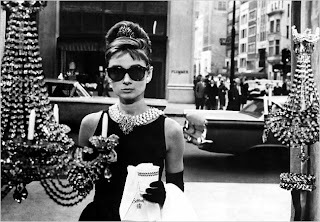 Nobody can do it quite like Holly Golightly. Like us, Holly isn't perfect. She certainly has issues - she was once married to an older man, has been arrested, and is somewhat of a kleptomaniac. Despite her flaws, she is still so captivating, her hunky neighbor chases her through the rain to profess his love AND helps find her cat in an alley to boot. Us single girls can only hope that we are alluring enough to be chased through the rain by a man worthy of our affection. It gives us another reason to wear that trenchcoat.